WHEN YOUR DREAM NANNY JOB EVENTUALLY POPS UP, YOU APPLY AND YOU’RE OFFERED AN INTERVIEW, YOU NOW NEED TO DEMONSTRATE WHY YOU ARE THE PERFECT NANNY FOR THE JOB AND SHOWCASE YOUR NANNY PORTFOLIO AT THE TIME OF INTERVIEWING WITH A PROSPECTIVE EMPLOYER. 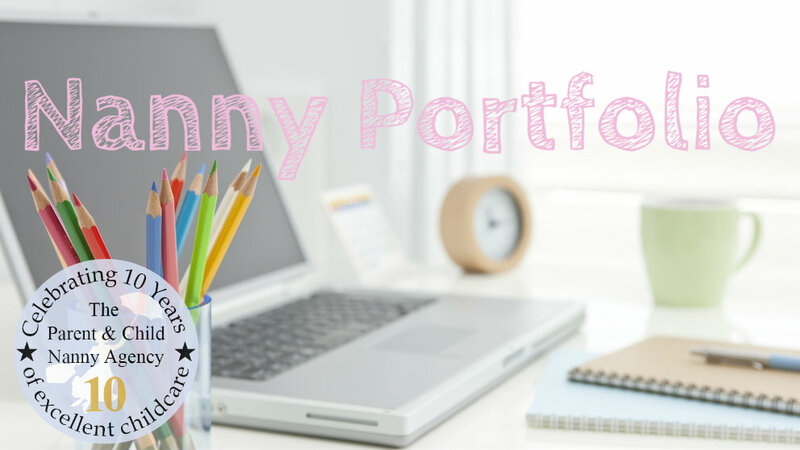 A NANNY PORTFOLIO ADDS A PERSONAL TOUCH AND DEMONSTRATES YOUR PROFESSIONALISM, ORGANISATIONAL SKILLS, COMMITMENT AND DEDICATION TO YOUR WORK AS A PROFESSIONAL NANNY. Start by purchasing a simple binder or book file with plastic inserts for your pages. Make sure this is of reasonable quality and keep it simple. Ensure there are enough page inserts to display all of your nanny related paperwork. Make sure this is up to date and keep a number of copies in each sleeve so that if requested, you can leave a copy of your professional CV with a prospective employer. A CV should be clear, simple and kept on as fewer pages as possible. These are formal nanny or childcare qualification certificates or your core skills training certificate. If you have additional or alternative qualifications such as Teaching, Maternity or Nursing qualifications, also include these. These include your Paediatric First Aid, Safeguarding, Baby-care, Water safety, Food and Hygiene, Nanny Cooking skills, Nanny Driving Certificates and any other childcare related courses you have attended. It doesn’t matter how old these certificates are, a range of certificates over the years showcases commitment to your continued professional development. Display written nanny references in Chronological order. If you do not have written references, type previous employers names and contact details neatly on to an A4 with copies that can be provided to a prospective employer. Make a note now to always ask your previous employer for a written reference when leaving a position. If you are out of touch with previous employers try making contact via social networking, most employers are happy to oblige no matter how long ago you were employed. You ca also gain references from families you babysit for, agencies and short term/temporary childcare related bookings. Include your DBS Enhanced Disclosure, Ofsted registration Certificate, Nanny Insurance, Related Car Insurance and membership with professional organisations such as Pacey, BAPN or Voice. Show attention to detail with samples of logs and schedules that showcase good planning such as Nanny Diary Logs, Weekly Meal Schedule/Sample Menu and Rainy day Crafts/activity ideas. You may wish to add a personal touch and add photos of you at work with other children/undertaking activities or on days out. It is essential you ask signed permission from parents or guardians of the children and those images are of an appropriate nature. A good Nanny portfolio will be clean, simple, and presentable and will contain copies of documents along with originals. Never leave your portfolio behind but be sure to offer this for a prospective employer to read through during the interview process. Take a look at our interview-guide-for-nannies to help land that dream job.